Jindabyne Valve House Spoil Dump was formed between 1964 and 1968 as a depository for spoil material excavated from the Jindabyne-Island Bend and Snowy-Geehi Tunnels. The site sits as a wedge of 300 000m3 of spoil in a valley about 140m above the Snowy River just to the north west of Lake Jindabyne. Water is periodically discharged from the Valve House stilling basin across the site with no functioning water pathway. The site prior to restoration. 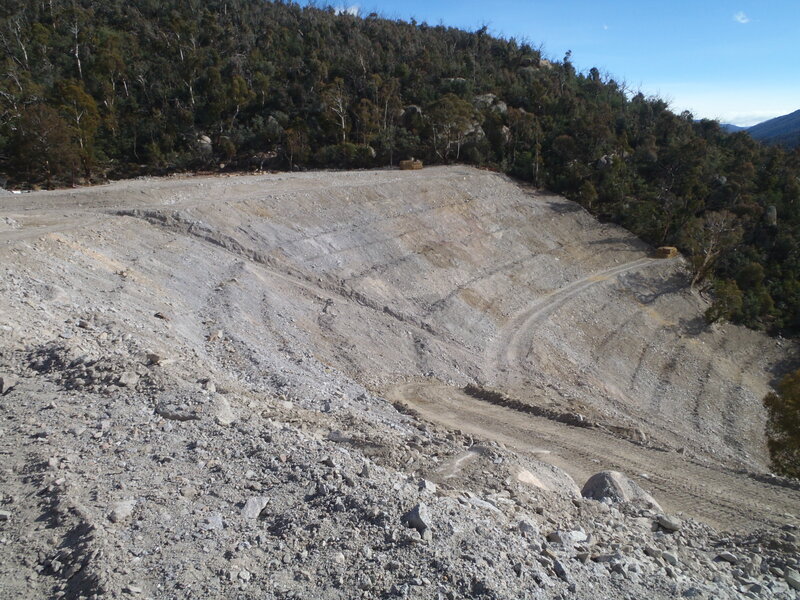 Prior to earthworks in 2010, Jindabyne Valve House Spoil Dump contained a quarry basin, an 80m concrete ‘path’ from dumped material over the edge of the spoil, and dumped scrap metal, wire, tanks and concrete slabs. 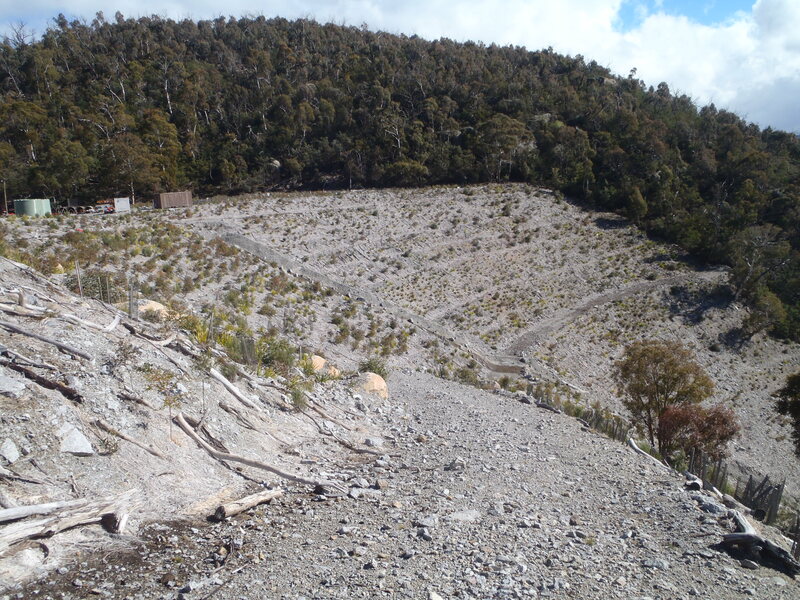 This highly degraded area sat immediately below a public lookout on the edge of Kosciuszko National Park. Fauna and vegetation surveys were conducted on and in the surrounding forest. A total of 28 bird, 12 mammal, six reptile and one amphibian species were recorded during the survey in the Jindabyne Valve House Rehabilitation Area, and no threatened species. No species were identified that could be adversely affected by proposed works. Weeds such as St Johns Wort (Hypericum perforatum) occurred at the edges of the site and minimal vegetation was found on the majority of the spoil. Treatments: Earthworks were undertaken on the site in May 2010. This included re-shaping the wedge of spoil into a stable slope with access tracks and benches, constructing a culvert and concrete / rock lined drain for water flow, and preparing the site for revegetation. Approx. 48, 000 m3 of rock was shifted, with the top bench area of 3000m 3 ripped for planting and 600m3 compost placed in piles across the site in a 2 month period. The site was planted with 35,000 native species tube stock in 2010 – 2011, and the entire site covered in rice straw and woodchip. Species planted are listed in Table 1. Results: Monitoring showed that 18 species had acheived about 38 percent cover of the site after one year, with nil weed cover (Table 2). Observations 3 years after treatment show that about 80% of all seedlings survived. Browsing of seedlings by macropods restricted some plant development. Lessons learned, Browsing animals (introduced and native) can impact plant growth rates, even on steep sites. On steep sites there is no simple solution to this. However planting densely, using tree guards where possible and providing thatch for seedling protection ameliorated the impact. 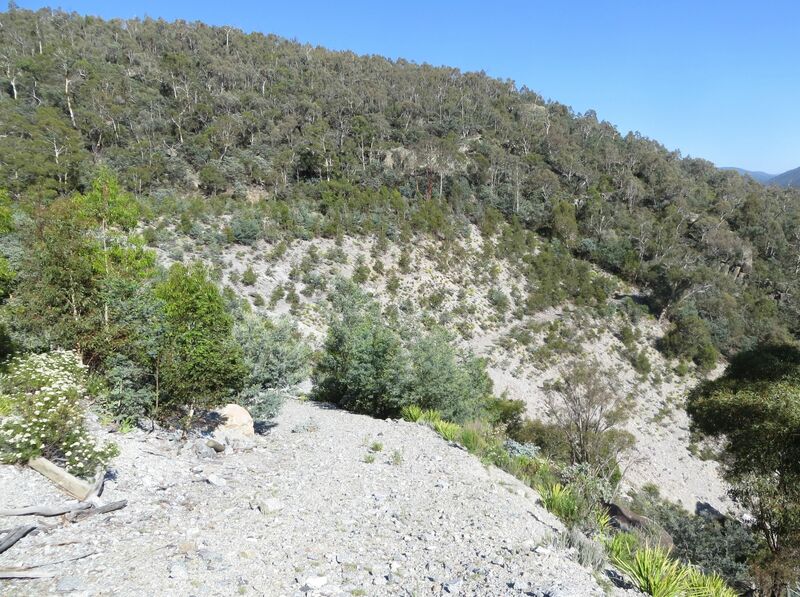 Providing key elements such as organic matter, nutrients, protective brush and viable plant material – along with reducing erosive processes – triggered successful revegetation on the site. Covering the ground with a layer of organic matter such as rice straw ameliorated temperature extremes on site, allowing young seedlings to survive and flourish. Table 2. Vegetation data recorded on a 50m transect approximately 12 months after treatment. (Data from Greening Australia Vegetation Monitoring Former Snowy-Hydro Sites Kosciuszko National Park). This entry was posted in Standards, Uncategorized. Bookmark the permalink.